I am not one of those women who love ‘slaving’ in the kitchen every day or feel the need to be a perfect cook, but over the years my love for cooking for my loved ones deepens-yes, it does get messy in the process, but I enjoy knowing that what my family and friends eat, nourishes them and gives them pleasure because I sprinkle every dish I make with love. 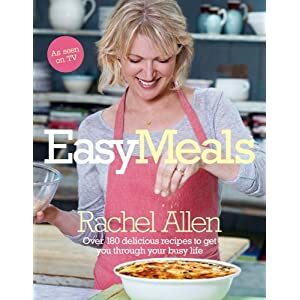 My kitchen shelves groan under the weight of kitchen tomes but my latest addition, ‘Easy Meals’ by Rachel Allen has been a huge success and has possibly put a few inches on my waist line in the last week alone. When I was recently sitting in the cosy and warm kitchen of my best friend, I started leafing through the book lying on the table and it was one of those rare moments when almost every dish made me want to go and cook it, so I placed the order the next day on my trusted Amazon and whoosh, on Monday the book landed on my doorstep with a hefty thud. Irish are the nation that warms my heart and when the Irish accent reaches my ear, I just melt. I have seen Rachel Allen’scookery programmes before but this book is really special as all of the recipes are quite straight-forward and every meal I cooked so far turned out to be bursting with flavour, yet not too tricky to make, particularly as your mind and body can already be exhausted from juggling way too much during the day. ‘Battered prawn stir-fry’ (advice-pay attention to your batter, my went a little pear-shaped) but the meal was delicious and I was happy to finish off the left-overs the following day; my best friend made ‘Pork chops with sage and apple’-yummy is the word for it-in my cooking experience pork tends to be a little tricky to cook as it can easily go ‘rubbery’ if you don’t cook it correctly and Rachel’s recipe for ‘Maple black pepper pork chops’ is even a step better. And don’t even get me started on the ‘Coconut macaroon meringue’-to invent this, is to be a cookery genius-it’s very easy to make but it tastes like heaven, with coconut, lime, mango and whipped cream creating the most indulgent combination that just gives you pure pleasure-those are the recepies from ‘Fast and Fabulous section’. ‘Salmon en papillote’-I made it with tomatoes and avocado and also made it as a ‘Thai flavoured fish’-both recipes quite easy to prepare and you would be hard pressed to make mistakes here, no matter how tired you are .) ‘Chicken, parsnip and potato bake‘ is perfect for this time of the year, yet not too heavy to have for a cosy weekend dinner, ‘Chocolate mousse cake’-pay attention to when you mix all the ingredients together and it will be so perfect, you will easily impress even a very experienced cook .) or competitive mothers at the school bake sale event-those recipes are from ‘Five Ingredients of Less section’. ‘Lamb and Chicken tagine’is a masterpiece as far as I am concerned, as I usually prefer to have this hearty course at the restaurant but this is simply a perfect tagine and I was quite impressed with myself-a glass of red wine goes so well here, particularly if you are feeling stressed-this recipe from ‘One Pot’ section will make the stomach happy and the mind more relaxed. I haven’t had the time to try anything from the last two sections, but my aim is to start making Rachel’s desserts because most of them look divinely moreish yet healthy. Well, even if I am kidding myself , autumn and winter are the perfect times to indulge during shorter and colder days and evenings. Rocksalt restaurant in FolkestoneJo Malone is back with a new fragrance venture!